"Strong commercial execution globally for KEYTRUDA, GARDASIL, BRIDION and other products led the company to deliver growth in the second quarter"
KENILWORTH, N.J.--(BUSINESS WIRE)--Merck (NYSE: MRK), known as MSD outside the United States and Canada, today announced financial results for the second quarter of 2018. Worldwide sales were $10.5 billion for the second quarter of 2018, an increase of 5 percent compared with the second quarter of 2017, including a 1 percent positive impact from foreign exchange. GAAP (generally accepted accounting principles) earnings per share assuming dilution (EPS) were $0.63 for the second quarter of 2018. Non-GAAP EPS of $1.06 for the second quarter of 2018 excludes acquisition- and divestiture-related costs, restructuring costs and certain other items. Year-to-date results can be found in the attached tables. Merck continued to expand its oncology program by further advancing the development programs for KEYTRUDA (pembrolizumab), the company’s anti-PD-1 therapy; Lynparza (olaparib), a PARP inhibitor being co-developed and co-commercialized with AstraZeneca; and Lenvima (lenvatinib mesylate), an orally available tyrosine kinase inhibitor being co-developed and co-commercialized with Eisai. Merck announced that the U.S. Food and Drug Administration (FDA) accepted for review a supplemental Biologics License Application (sBLA) for KEYTRUDA as a first-line treatment for metastatic squamous non-small cell lung cancer (NSCLC), regardless of PD-L1 expression. The sBLA, which is seeking accelerated approval for this new indication, is based on overall response rate (ORR) data from the pivotal Phase 3 KEYNOTE-407 trial, which were recently presented at the American Society of Clinical Oncology (ASCO) 2018 Annual Meeting. The FDA granted Priority Review and set a PDUFA date of Oct. 30, 2018. Additional data showing a significant improvement in overall survival (OS) were also presented, making this the fifth study in advanced NSCLC in which KEYTRUDA demonstrated an improved survival benefit. Merck announced results from KEYNOTE-042, a pivotal Phase 3 study evaluating KEYTRUDA as monotherapy for the first-line treatment of locally advanced or metastatic nonsquamous or squamous NSCLC with PD-L1 tumor proportion score of ≥1 percent without EGFR or ALK genomic tumor aberrations. In this study, KEYTRUDA monotherapy resulted in significantly longer OS than platinum-based chemotherapy. These results were presented in the plenary session and during the press program at ASCO 2018. Merck announced interim data from a cohort of the Phase 2 KEYNOTE-158 study evaluating KEYTRUDA as monotherapy in patients with previously treated advanced small cell lung cancer (SCLC). Findings showed an ORR, the primary endpoint of the study, of 18.7 percent in patients in the SCLC cohort. Additionally, in a pre-specified exploratory analysis, ORR was 35.7 percent in patients whose tumors expressed PD-L1 with a combined positive score (CPS) of ≥1. These results, as well as other findings from the KEYNOTE-158 cohort in SCLC, were presented for the first time at ASCO 2018. The company announced that the pivotal Phase 3 KEYNOTE-048 trial investigating KEYTRUDA for first-line treatment of recurrent or metastatic head and neck squamous cell carcinoma (HNSCC), met a primary endpoint of OS as monotherapy in patients whose tumors expressed PD-L1 (CPS≥20). KEYTRUDA is the first anti-PD-1 therapy to show an OS benefit as first-line therapy for recurrent or metastatic HNSCC. At the time of the interim analysis, the dual-primary endpoint of progression-free survival (PFS) for patients whose tumors expressed PD-L1 (CPS≥20) had not been reached. These results will be presented at an upcoming medical meeting and submitted to regulatory authorities worldwide. Merck announced that KEYTRUDA has been approved by the China National Drug Administration for the treatment of adult patients with unresectable or metastatic melanoma following failure of one prior line of therapy. This is the first and only approval of an anti-PD-1 therapy for advanced melanoma in China. The FDA accepted and granted Priority Review for a new sBLA seeking approval for KEYTRUDA as a treatment for previously treated patients with advanced hepatocellular carcinoma, based on data from the Phase 2 KEYNOTE-224 trial, which were presented at ASCO 2018. The FDA set a PDUFA date of Nov. 9, 2018. Merck announced that the FDA accepted for standard review a new sBLA for KEYTRUDA as adjuvant therapy in the treatment of patients with resected, high-risk stage III melanoma and granted a PDUFA date of Feb. 16, 2019. This sBLA is based on a significant benefit in recurrence-free survival demonstrated by KEYTRUDA in the pivotal Phase 3 EORTC1325/ KEYNOTE-054 trial, which was conducted in collaboration with the European Organisation for Research and Treatment of Cancer. For the treatment of adult and pediatric patients with refractory primary mediastinal large B-cell lymphoma, or who have relapsed after two or more prior lines of therapy. For the treatment of patients with recurrent or metastatic cervical cancer with disease progression on or after chemotherapy whose tumors express PD-L1 as determined by an FDA-approved test. Merck and AstraZeneca announced positive results from the randomized, double-blinded, placebo-controlled, Phase 3 SOLO-1 trial of Lynparza tablets, showing women with BRCA-mutated (BRCAm) advanced ovarian cancer treated first-line with Lynparza maintenance therapy had a statistically significant and clinically meaningful improvement in PFS compared to placebo. Merck and AstraZeneca announced that Japan’s Pharmaceuticals and Medical Devices Agency approved Lynparza tablets for use in patients with unresectable or recurrent BRCAm, human epidermal growth factor receptor 2 (HER2)-negative breast cancer who have received prior chemotherapy. Merck and AstraZeneca announced that the European Medicines Agency approved Lynparza tablets for use as a maintenance therapy for patients with platinum-sensitive relapsed high-grade, epithelial ovarian, fallopian tube or primary peritoneal cancer who are in complete response or partial response to platinum-based chemotherapy, regardless of BRCA status. Merck and AstraZeneca presented data from the Phase 2 Study 08 trial, which showed clinical improvement in median radiologic PFS with Lynparza in combination with abiraterone compared to abiraterone monotherapy, a current standard of care, in metastatic castration-resistant prostate cancer. Merck and Eisai announced results from presentations of new data and analyses of Lenvima in combination with KEYTRUDA in four different tumor types: unresectable hepatocellular carcinoma, squamous cell carcinoma of the head and neck, advanced renal cell carcinoma and advanced endometrial carcinoma. The data were included in presentations at ASCO 2018. The company also continued to advance its vaccines and HIV pipelines. Merck announced that the FDA accepted for review a new sBLA for GARDASIL 9 (Human Papillomavirus 9-valent Vaccine, Recombinant), the company’s nine-valent HPV vaccine, for an expanded age indication for use in women and men 27 to 45 years old for the prevention of certain cancers and diseases caused by the nine human papillomavirus (HPV) types covered by the vaccine. The FDA granted Priority Review and set a PDUFA date of Oct. 6, 2018. China’s Food and Drug Administration approved GARDASIL 9 for use in girls and women 16 to 26 years old. Merck announced Week 96 results from the Phase 3 DRIVE-FORWARD clinical trial evaluating the efficacy and safety of doravirine (DOR), the company’s investigational non-nucleoside reverse transcriptase inhibitor, in combination with other antiretroviral agents, for the treatment of HIV-1 infection in adult patients with no prior antiretroviral treatment history. At Week 96, 73.1 percent of the group treated with once-daily DOR plus FTC/TDF or ABC/3TC achieved viral suppression as measured by the proportion of patients who achieved HIV-1 RNA of less than 50 copies/mL, compared to 66.0 percent of the group treated with once-daily ritonavir-boosted darunavir (DRV+r) plus FTC/TDF or ABC/3TC. These study results were presented as a late-breaking abstract at the recent 22nd International AIDS Conference. Second-quarter pharmaceutical sales increased 6 percent to $9.3 billion, including a 3 percent positive impact from foreign exchange. The increase was primarily driven by growth in oncology, vaccines and hospital acute care, partially offset by lower sales in virology and the ongoing impacts of the loss of market exclusivity for several products. Growth in oncology was driven by a significant increase in sales of KEYTRUDA, reflecting the company’s continued launches with new indications globally and the strong momentum for the treatment of patients with NSCLC, as KEYTRUDA is the only anti-PD-1 approved in the first-line setting. Additionally, oncology sales reflect alliance revenue of $44 million related to Lynparza and $35 million related to Lenvima, which represents Merck’s share of profits from product sales, net of cost of sales and commercialization costs. Growth in vaccines was primarily driven by higher sales of GARDASIL [Human Papillomavirus Quadrivalent (Types 6, 11, 16 and 18) Vaccine, Recombinant] and GARDASIL 9, vaccines to prevent certain cancers and other diseases caused by HPV, reflecting growth in Asia Pacific, primarily due to the ongoing commercial launch in China, and growth in Europe, partially offset by lower sales in the United States due to the continued transition to the two-dose regimen. Vaccines performance was negatively affected by a significant decrease in sales of ZOSTAVAX (zoster vaccine live), a vaccine for the prevention of herpes zoster, primarily due to the approval of a competitor product that received a preferential recommendation from the U.S. Advisory Committee on Immunization Practices in October 2017. The company anticipates that future sales of ZOSTAVAX will continue to be unfavorably affected by this competition. Growth in hospital acute care reflects strong global demand of BRIDION (sugammadex) Injection 100 mg/mL, a medicine for the reversal of neuromuscular blockade induced by rocuronium bromide or vecuronium bromide in adults undergoing surgery. Pharmaceutical sales growth in the quarter was partially offset by lower sales in virology, largely reflecting a significant decline in ZEPATIER (elbasvir and grazoprevir), a medicine for the treatment of chronic hepatitis C virus genotypes 1 or 4 infection, due to increasing competition and declining patient volumes, which the company expects to continue. Pharmaceutical sales growth for the quarter was also partially offset by the ongoing impacts from the loss of U.S. market exclusivity for ZETIA (ezetimibe) in late 2016 and VYTORIN (ezetimibe/simvastatin) in April 2017, medicines for lowering LDL cholesterol; and biosimilar competition for REMICADE (infliximab), a treatment for inflammatory diseases, in the company’s marketing territories in Europe. Animal Health sales totaled $1.1 billion for the second quarter of 2018, an increase of 14 percent compared with the second quarter of 2017, including a 2 percent positive impact from foreign exchange. Growth was driven by higher sales of companion animal products, primarily from the BRAVECTO (fluralaner) line of products that kill fleas and ticks in dogs and cats for up to 12 weeks, due in part to a delayed flea and tick season and the timing of customer purchases. Growth was also driven by livestock products, including poultry, ruminants and swine products. Gross margin was 67.3 percent for the second quarter of 2018 compared to 68.6 percent for the second quarter of 2017. The decrease in gross margin for the second quarter of 2018 was primarily driven by the amortization of amounts capitalized for potential future milestone payments related to collaborations, the amortization of unfavorable manufacturing variances, in part resulting from the June 2017 cyber-attack, as well as the unfavorable effects of foreign exchange. The decrease was partially offset by a lower net impact of acquisition- and divestiture-related costs and restructuring costs, which reduced gross margin by 7.1 percentage points in the second quarter of 2018 compared with 8.7 percentage points in the second quarter of 2017. Marketing and administrative expenses were $2.5 billion in the second quarter of 2018, comparable to the second quarter of 2017, reflecting the unfavorable effects of foreign exchange and higher administrative costs, offset by lower promotion and direct selling costs. Research and development (R&D) expenses were $2.3 billion in the second quarter of 2018 compared with $1.8 billion in the second quarter of 2017. The increase was driven primarily by a $344 million charge for the Viralytics Limited (Viralytics) acquisition, increased clinical development spending, in particular from oncology collaborations, as well as investment in early drug development. GAAP EPS was $0.63 for the second quarter of 2018 compared with $0.71 for the second quarter of 2017. The non-GAAP gross margin was 74.4 percent for the second quarter of 2018 compared to 77.3 percent for the second quarter of 2017. The decrease in non-GAAP gross margin was predominantly due to the amortization of amounts capitalized for potential future milestone payments related to collaborations, the amortization of unfavorable manufacturing variances, in part resulting from the June 2017 cyber-attack, as well as the unfavorable effects of foreign exchange. Non-GAAP marketing and administrative expenses were $2.5 billion in the second quarter of 2018, comparable to the second quarter of 2017, reflecting the unfavorable effects of foreign exchange and higher administrative costs, offset by lower promotion and direct selling costs. Non-GAAP R&D expenses were $1.9 billion in the second quarter of 2018, a 9 percent increase compared to the second quarter of 2017. The increase primarily reflects higher clinical development spending, in particular from oncology collaborations, as well as investment in early drug development. Non-GAAP EPS was $1.06 for the second quarter of 2018 compared with $1.01 for the second quarter of 2017. Merck narrowed its full-year 2018 revenue range to be between $42.0 billion and $42.8 billion, including a slightly positive impact from foreign exchange at current exchange rates. 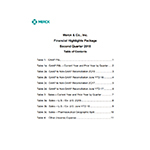 Merck narrowed and raised its full-year 2018 GAAP EPS range to be between $2.51 and $2.59. Merck narrowed and raised its full-year 2018 non-GAAP EPS range to be between $4.22 and $4.30. Both include an approximately 1 percent negative impact from foreign exchange at current exchange rates. The non-GAAP range excludes acquisition- and divestiture-related costs, costs related to restructuring programs, charges related to the formation of the Eisai collaboration and the Viralytics acquisition, and certain other items. The following table summarizes the company’s 2018 financial guidance. **EPS guidance for 2018 assumes a share count (assuming dilution) of approximately 2.7 billion shares. The expected full-year 2018 GAAP effective tax rate of 23.0 percent to 24.0 percent reflects an unfavorable impact of approximately 4.5 percentage points from the above items. Investors, journalists and the general public may access a live audio webcast of the call today at 8:00 a.m. EDT on Merck’s website at http://investors.merck.com/events-and-presentations/default.aspx. Institutional investors and analysts can participate in the call by dialing (706) 758-9927 or (877) 381-5782 and using ID code number 6985606. Members of the media are invited to monitor the call by dialing (706) 758-9928 or (800) 399-7917 and using ID code number 6985606. Journalists who wish to ask questions are requested to contact a member of Merck’s Media Relations team at the conclusion of the call. 2 Merck is providing certain 2018 and 2017 non-GAAP information that excludes certain items because of the nature of these items and the impact they have on the analysis of underlying business performance and trends. Management believes that providing this information enhances investors’ understanding of the company’s results as it permits investors to understand how management assesses performance. Management uses these measures internally for planning and forecasting purposes and to measure the performance of the company along with other metrics. Senior management’s annual compensation is derived in part using non-GAAP income and non-GAAP EPS. This information should be considered in addition to, but not as a substitute for or superior to, information prepared in accordance with GAAP. For a description of the items, see Table 2a attached to this release. 3 Animal Health segment profits are comprised of segment sales, less all materials and production costs, as well as marketing and administrative expenses and research and development costs directly incurred by the segment. For internal management reporting, Merck does not allocate general and administrative expenses not directly incurred by the segment, nor the cost of financing these activities. Separate divisions maintain responsibility for monitoring and managing these costs, including depreciation related to fixed assets utilized by these divisions and, therefore, they are not included in segment profits. 5 On Jan. 1, 2018, the company adopted a new accounting standard related to defined benefit plans. Upon adoption, net periodic benefit cost/credit other than service cost was reclassified to Other (income) expense, net from the previous classifications within Materials and production costs, Marketing and administrative expenses and Research and development costs. Previously reported amounts have been reclassified to conform to the new presentation. 6 Represents the difference between calculated GAAP EPS and calculated non-GAAP EPS, which may be different than the amount calculated by dividing the impact of the excluded items by the weighted-average shares for the period. (2) Research and development expenses in the second quarter and first six months of 2018 include a $344 million charge for the acquisition of Viralytics Limited. Research and development expenses in the first six months of 2018 also include a $1.4 billion aggregate charge related to the formation of a collaboration with Eisai Co., Ltd (Eisai). (3) Represents separation and other related costs associated with restructuring activities under the company's formal restructuring programs. (4) The effective income tax rate for the first six months of 2018 reflects the unfavorable impact of a $1.4 billion aggregate pretax charge related to the formation of a collaboration with Eisai for which no tax benefit was recognized. (1) Amounts included in materials and production costs reflect expenses for the amortization of intangible assets recognized as a result of business acquisitions. Amounts included in marketing and administrative expenses reflect integration, transaction and certain other costs related to business acquisitions and divestitures. Amounts included in research and development expenses reflect an increase in the estimated fair value measurement of liabilities for contingent consideration. Amounts included in other (income) expense, net reflect an increase in the estimated fair value measurement of liabilities for contingent consideration, partially offset by royalty income related to the termination of the Sanofi-Pasteur MSD joint venture. (3) Amount included in research and development expenses represents a charge for the acquisition of Viralytics Limited. (3) Amounts included in research and development expenses represent a $1.4 billion aggregate charge related to the formation of a collaboration with Eisai Co., Ltd., as well as a $344 million charge for the acquisition of Viralytics Limited. (2) Total Vaccines sales were $1,561 million and $1,533 million in the first and second quarters of 2018, respectively, and $1,516 million, $1,404 million, $1,924 million and $1,704 million for the first, second, third and fourth quarters of 2017, respectively. (3) Total Diabetes sales were $1,433 million and $1,571 million in the first and second quarters of 2018, respectively, and $1,338 million, $1,520 million, $1,531 million and $1,533 million for the first, second, third and fourth quarters of 2017, respectively.